CHAPTER 1: IN WHICH WE WAIT. AND WAIT. AND WAIT SOME MORE. Balkans & Beyond, Days 1 & 2: Atlanta to Amsterdam to Vienna. After exploring northern Europe last summer, we knew we had to go southeast for our next European journey. With the exception of tiny Andorra, Liechtenstein and San Marino plus a couple of islands (we're talking about you, Malta and Cyprus), we've visited all the countries that are considered part of Europe with the exception of those on the Balkan peninsula. Bordered by the Adriatic, Ionian, Aegean and Black Seas, the region takes its name from the Balkan Mountains, which stretch across much of the peninsula. Not only is this area, about the size of Texas, geographically interesting, its recorded history runs deep, often characterized by chaos and conflict. Thanks to a series of foreign invasions over the last two millennia, the Balkan peninsula has been divided and subdivided, regrouped, and repartitioned many times, usually with contentious results. In fact, the term balkanization was coined to describe "the process of fragmentation or division of a region or state into smaller regions or states that are often hostile or uncooperative with one another." Perhaps a picture can tell it best. Examine the animation below (from Wikipedia), and consider that it covers only the most recent 200 years in an area where historic relics date events back more than 2,000. So we made our plans to visit this region and packed our bags, determined to learn more about its fascinating history. Though we decided to keep our plans loose, with accommodations booked only for the first week, we thought everything was well-organized for an auspicious beginning. Then fate had a different idea. 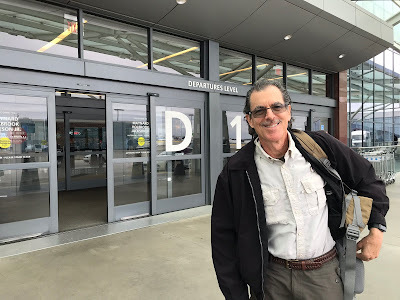 The Uber ride we had pre-booked to deliver us to the Atlanta airport didn't materialize, so we called for a new one, were picked up promptly, and figured when we arrived at the international terminal that our stumbles were done. But that's before we learned about the fan. Passengers were boarded promptly, if not efficiently, for our 5:18 pm Delta flight to Amsterdam. As we sat waiting for the aircraft to push back from the gate, the clock kept ticking. Right past our departure time it went. Finally the pilot announced that mechanics were on board attempting to repair a vent fan that was used when the plane was on the ground, but that it should be completed soon so we could leave. Except it wasn't. Shortly after his announcement, the first of many alerts popped up on my phone from Delta. Our flight was delayed until 6:10. 6:50. 7:15. 7:50. And on it went. Just before 8:00, technicians determined that the issue could not be addressed in time for departure, and passengers were deplaned with instructions to remain in the gate area as Delta searched for another aircraft to take us to Amsterdam. 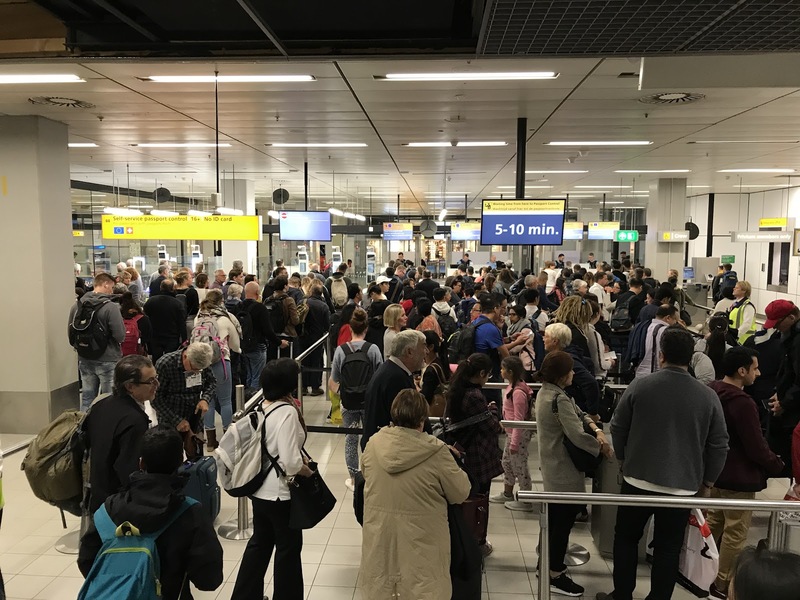 Frustrated by the series of delays, passengers lined up to implore Delta agents to get them on another flight or rebook their connections in Amsterdam. 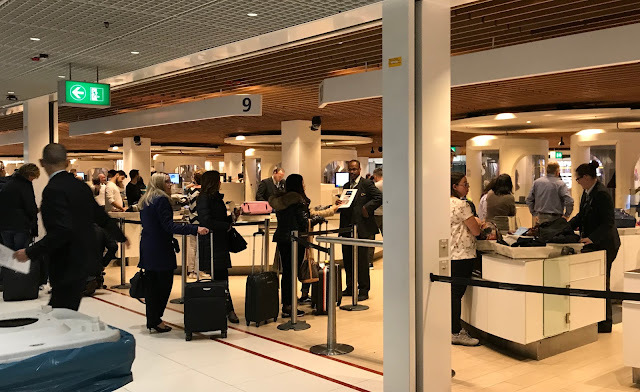 Those whose connections were booked through Delta or their partner airlines would be automatically adjusted after we departed and our arrival time was established, but apparently some were unconvinced or wanted a voice in the selection of new arrangements. Power hungry passengers who had been using their devices for entertainment during the delay swarmed to available electrical outlets to recharge. Much sooner than we expected, gate agents announced that an aircraft had been located for our trip and was at a nearby gate unloading passengers from Phoenix. By the time the plane was cleaned and serviced, bags and catering and cargo were transferred from the previous aircraft, it was 10:45 when we finally boarded. Then we had another opportunity to gate wait for half an hour as the beleaguered ground crew made needle in haystack searches for the checked bags of flyers who had abandoned the flight to seek other arrangements. At 11:15, almost six hours after our original departure time, we finally left Atlanta. 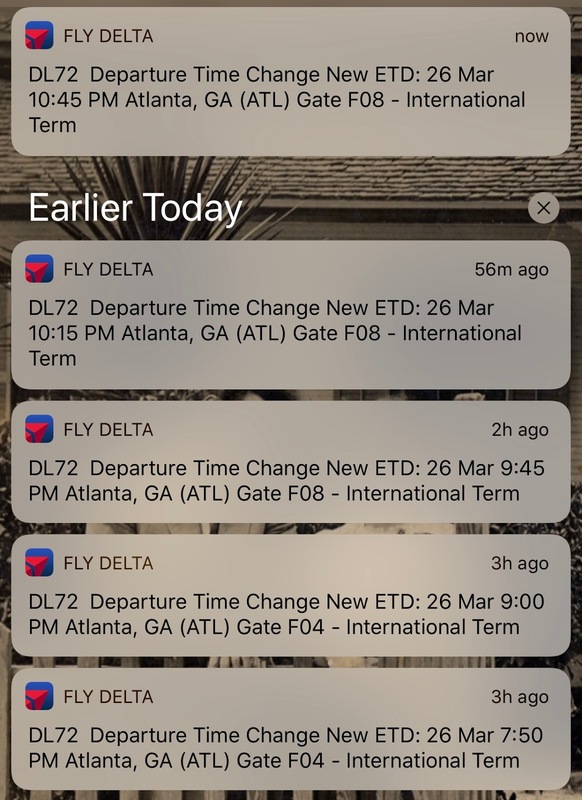 In light of some of the horror stories in the news, we thought Delta handled the delay well, from the pilot who tried to keep us informed with announcements to the flight crew who sympathized and tried to alleviate our frustrations. The gate agents were also courteous and sincerely seemed to want to help. 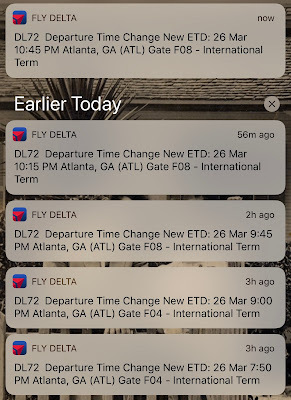 Even the text messages from the Delta app made us feel like we were being kept "in the loop." Following a restless night, we arrived in Amsterdam at 1:30 pm. As our plane taxied toward the terminal, we looked out the window and saw our ride to Vienna leaving without us. No, we were not among those who booked our connecting flight with Delta. 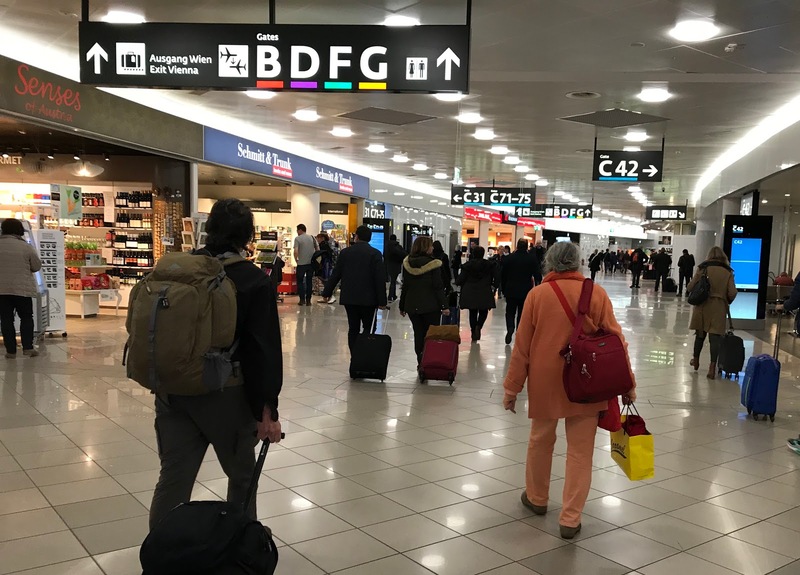 But we left ourselves a six-hour cushion to make the 1:30 EasyJet flight to Vienna, the same six hours that were vaporized by the delay in Atlanta. After exiting passport control, we left the secure area to talk to airline agents and book a new flight to Vienna. 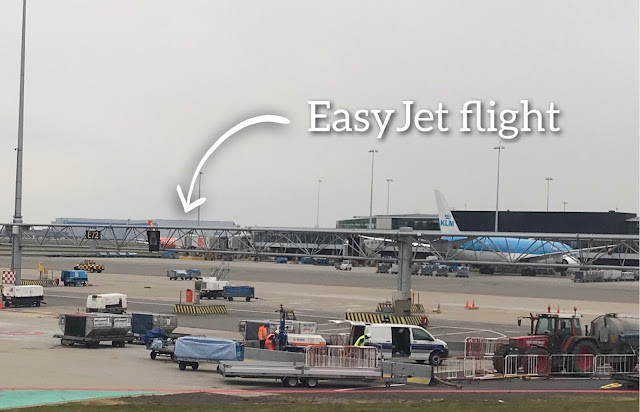 When we learned that EasyJet had only one daily flight to Vienna, we made a new booking with KLM to take us to Austria's capital city at 5:15 pm. To reach our gate, of course, we had to undergo the Dutch security screening. It was an eye-opening experience that made us realize how lax American TSA agents have become. Either that or the Dutch agents were competing for a prize for the employee who provided the most thorough passenger examinations. Though we both had removed every single thing from our pockets, we were each subjected to an enthusiastic frisking after being flagged by the walk-through metal detector. I could see on the screen the areas of concern on my body (my left shoulder and outside right thigh) but apparently the security agent could not because she groped parts of my body that were nowhere near the designated areas, including dipping her hand into the back waistband of my pants. But my bags had it worse than I did. I made the mistake of leaving my iPad and a small bottle of hand sanitizer in my day bag, targeting me as a suspicious character. Every single thing I was carrying was subjected to scrutiny, even down to looking between the credit cards in my wallet. For explosive devices? Unauthorized liquids? By the time two agents finished and found I was harmless after all, my belongings were in a shambles and I had to remove and repack everything in my roll-aboard and day bag. The one consolation was the resolute courtesy and respect of the security agents, even the one with her hand in my pants, a major contrast with our own TSA tyrants. Unlike the Balkans, our series of unfortunate events had finally ended—for this part of the journey anyway. The KLM flight departed only 2 minutes late, and we were delighted by the sight of the Vienna airport when we finally arrived just after 7 pm the day after leaving home. 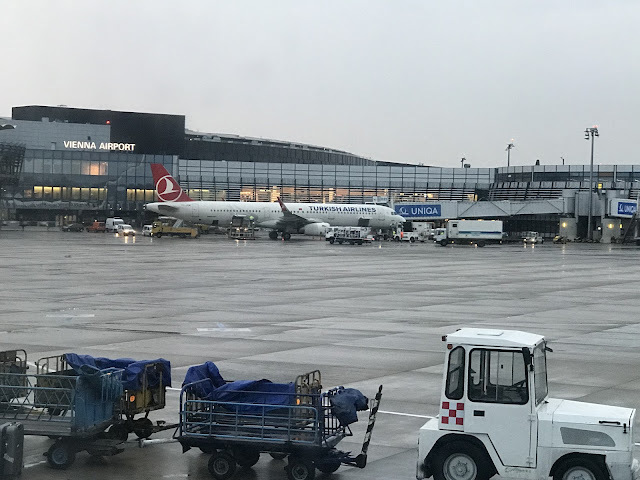 A friendly and gregarious Turkish Uber driver welcomed us to Vienna and transformed our half-hour ride from the remote Vienna airport to our hotel into a visit between new friends. Since we were coming to the southeast, we decided to tack on brief stops in Vienna, Bratislava and Budapest before entering the Balkans. While in Vienna, we'll visit the childhood homes of Ken's parents and pay our respects at the local cemetery to some of his ancestors, as well as seeing some of the city's sights. • Hours of sleep on board: 1/6 + 1/4 + 1/10 + 1/3, etc. Loved: The sight of the Vienna airport when we finally arrived. Learned: Many hours after we had both been groped by Dutch security agents, we finally realized that had we booked our new flight to Vienna from our smartphone, we would probably have been able to transfer to our new gate without leaving the airport's secure zone. On the other hand, the experience was good preparation for our return flight from Amsterdam in June, when we'll be the poster children for conscientious passengers. In the future, we may be more likely to book connecting flights through the same airline so they can do the rebooking for us without the extra cost we incurred due to the wasted EasyJet fare. Weary passengers wait for equipment prep in Atlanta. The promised 5-10 minute wait for passport control in Amsterdam was overly optimistic but not by much. 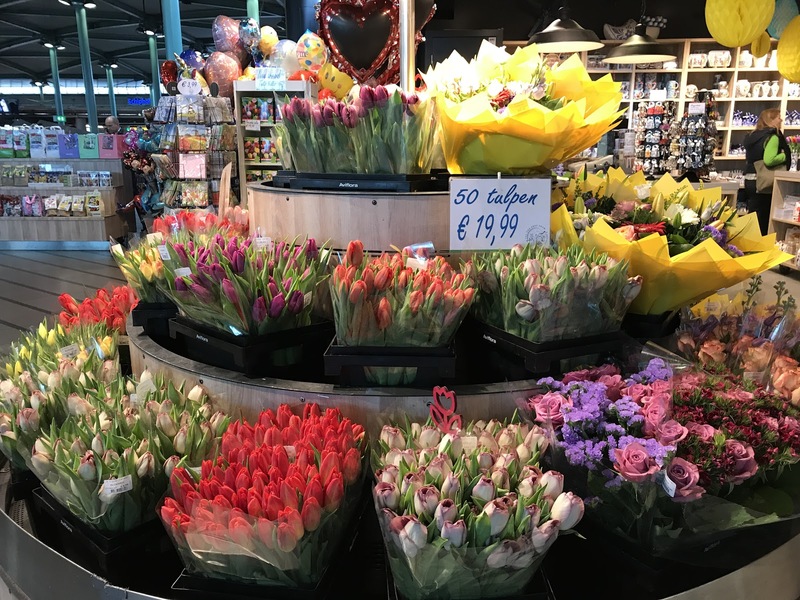 Airport vendors know what tourists want to find in Amsterdam. 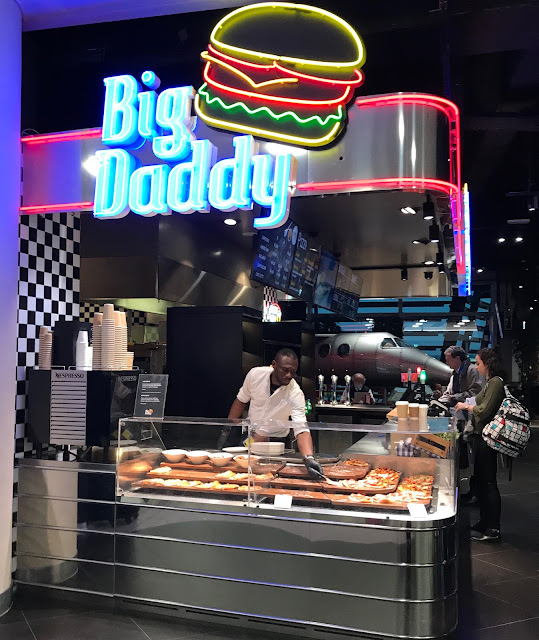 A burger joint in the Vienna airport, on the birthday of our brother-in-law, called Big Daddy by his family.